Thank you for joining us for the Anything Goes Challenge and we hope you will all join us again this week too. there are several ways you can create a mask, by simply tearing paper you can create hills and valleys, die cutting a shape, using a stencil or masking fluid or simply stamping an image onto scratch paper and cutting around it. The possibilities are almost endless! We will be looking forward to seeing what technique you use to create your project! As always Simon Says Stamp will be giving away $50 voucher to shop at the fabulous Simon Says Stamp Store. I have two cards to share for this challenge. When I started planning my card for the challenge, I wanted to use white as my card base. After making the first card, I was curious to know how a similar layout will look on Fog cardstock. So I made another. Here is the first card using white card base. This is an one layer card. I die cut an oval out of masking paper. Adhered the mask vertically on a white card front and stamped the images from Beautiful Day and Peony Bouquet stamp sets from Altenew. I stamped half the image on the mask and half on the cardstock. I over lapped a few. 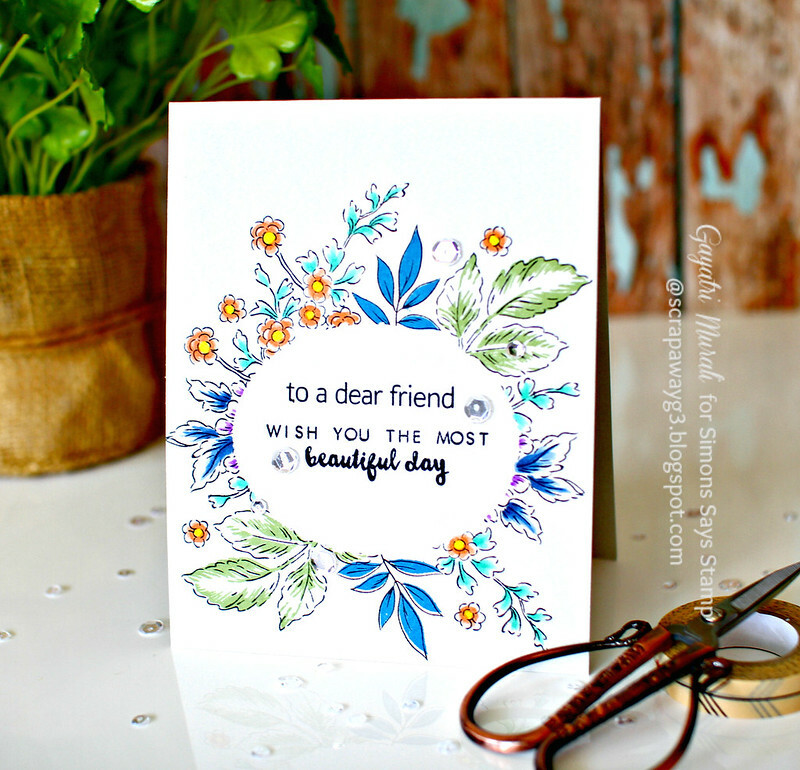 I used the layering images to stamp with coloured inks such as Forest Glades and Dusk Altenew inks. 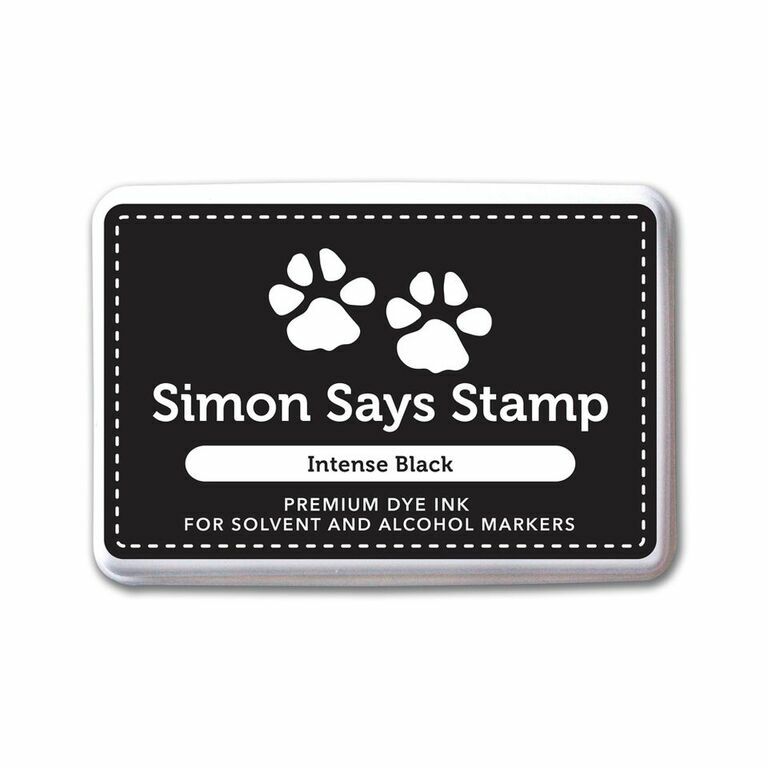 Some of the images I just stamped in Simon Says Stamp Intense Black Ink. I stamped all around the oval mask. I removed the mask to reveal the white oval space where I have stamped my sentiment. 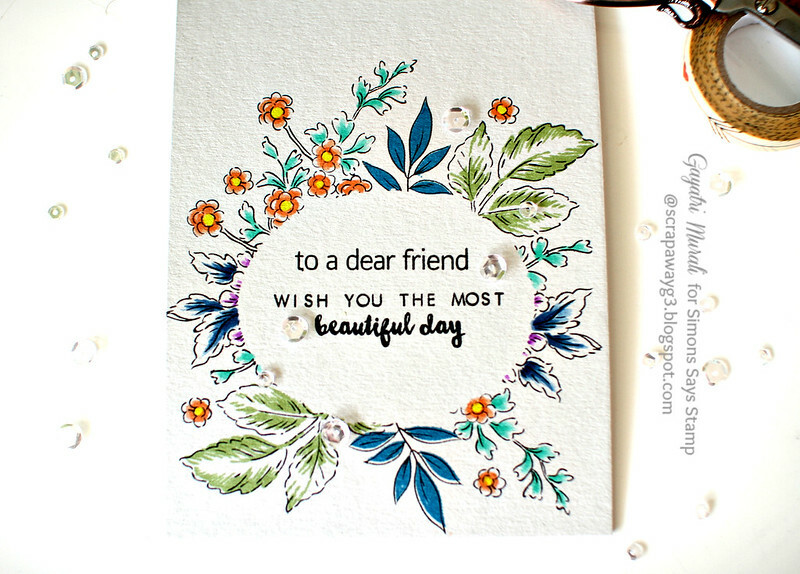 The sentiment is from Birthday Greetings stamp set from Altenew. Finally embellished with Sparkly Clear sequins from Pretty Pink Posh. I absolutely love the green, blue and black colour combination. 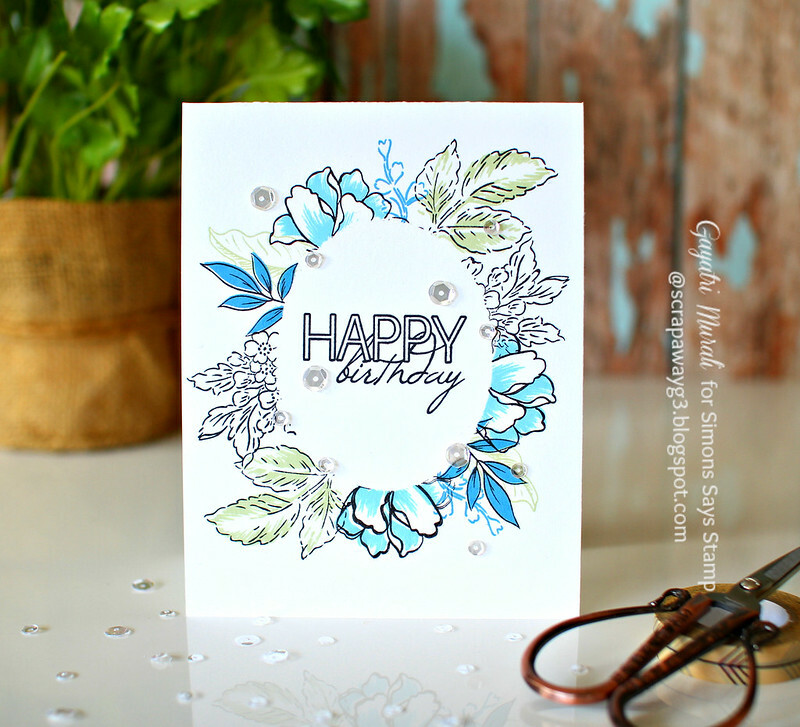 Now I did similar process on Fog cardstock from Simon Says Stamp. This time I adhered the oval mask horizontally on the card front and stamped the images from the same two stamp sets from Altenew using Simon Says Stamp Intense Black Ink. This time I stamped a few layering images with Altenew Dusk and Forest Glades inks and rest of the images I coloured with copic markers. I did some messy copic colouring not covering the entire images but just shading certain areas of images. I then removed the mask and stamped the sentiment inside the masked area. 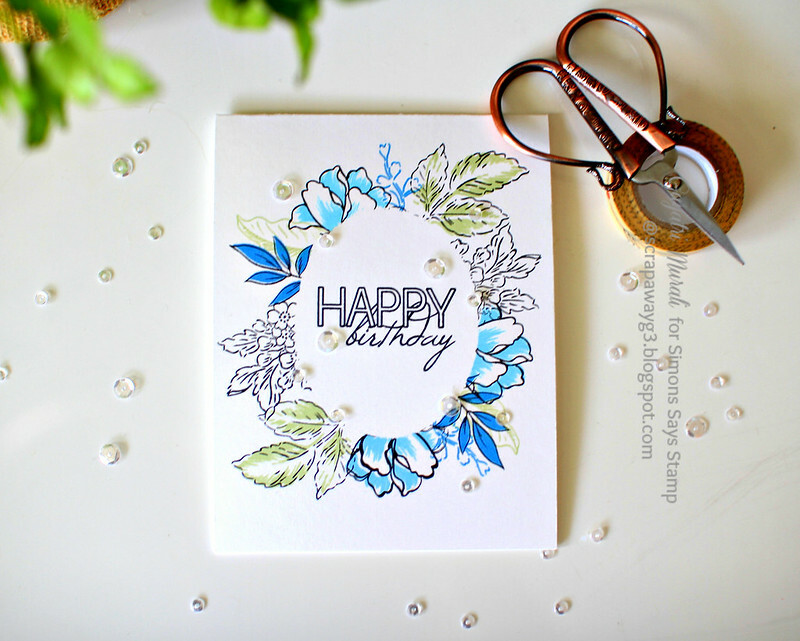 The sentiments are from Beautiful Day and Birthday Greetings stamp sets from Altenew. Again I embellished with Sparkly Clear sequins from Pretty Pink Posh. SO pretty, Gayatri – love each one. The fog cardstock was a fantastic idea, too! 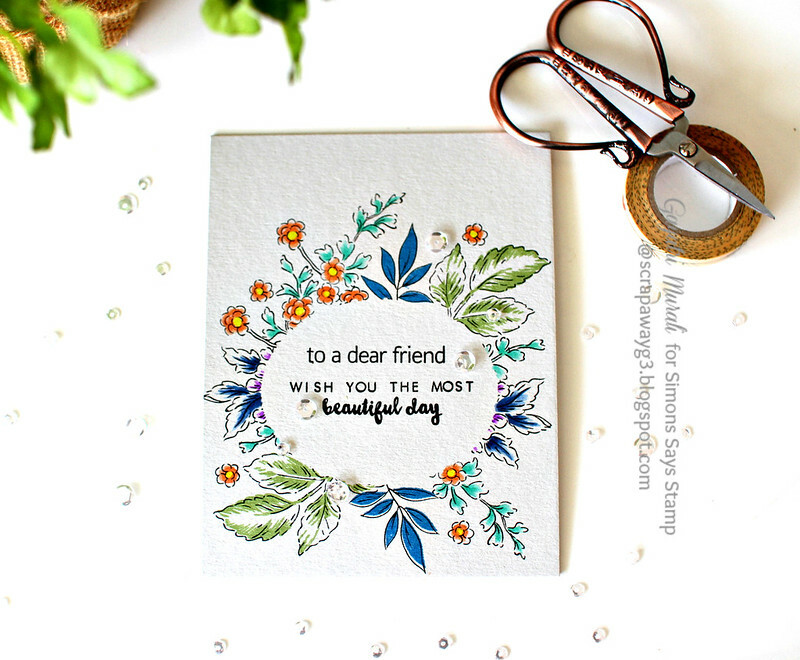 Beautiful cards Gayatri! I love both the version – so gorgeous! 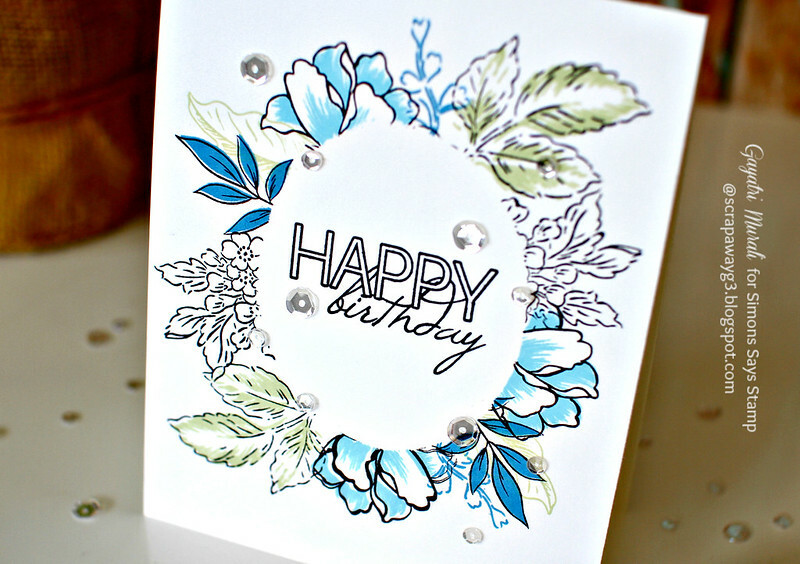 very pretty cards Gayatri. The flowers around the ovals are lovely. Fun use of masking to spotlight a sentiment! Love it! Love the masking technique and the end result Gayatri – must try that with my Peony Bouquet set – thanks for the inspiration!